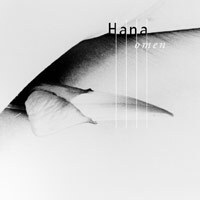 Hana - "Omen" / Land - "Road Movies"
The first release by the duo of Jeff Greinke (solo artist and Land frontman) and Anisa Romero (ex-Sky Cries Mary) was entitled 'Hana,' and now they've elevated that moniker to bandname status. In the process, the two have enlisted the help of Land's Fred Chalenor on acoustic bass (and occasionally electric bass and also 'stick') and also Anisa's former Sky Cries Mary bandmates Ben Ireland (drums) and Roderick Romero (guesting on one track). I can't really say the formation of a more formalized 'band' was the important step that led them from the disappointing debut to 'Omen,' but something is definitely different 'cause 'Omen' is really a fantastic piece of work. Greinke is an electronic soundscapist type, and his solo work is a little too sparse for my tastes, but I can't argue that the guy isn't capable of creating a proper mood for others to further enhance. Although the whole 53-minute work runs together seamlessly like one long symphony, there are rhythmic mode shifts in places. "Too Much" comes off like a krautrock 'bossa-nova' with decidedly Liebezeit-esque drumming, and prominent acoustic bass and spacey synths. Very nice. "Death" (following the dark, dreamy intro) is uptempo and hardly dirge-like but rather more like Korai Orom, with a cool smooth bassline (perhaps that's actually the stick-playing here? ), and an effective thumpy real/fake drum synthesis. There are also a few more techno-ish passages that appear in 'Omen,' but they are never of the mind-assaulting type. In essence, 'Omen' might seem like a sullen and introverting affair (which I guess it may be), but I found the whole thing rather inspiring rather than depressing. I don't often take to overtly 'non-rock' formulations (nary a guitar to be heard here), but when I do...well, this album has the same effect on me as Cluster's 'Sowiesoso.' One of my choices for the year's best. While I'm at it, I'll say a few words about Greinke's other band project Land, a somewhat similar five-piece band also including bassist Chalenor mainly on electric here. 'Road Movies' came out earlier last year I think, this one an all-instrumental affair with a variety of influences invading the predominantly (I suppose) 'groovy jazz' style. Unlike Hana, there's guitar here (Dennis Rea) but hardly any riffing, the cool basslines and Greinke's electronic rhythms still the dominant force. Drummer Bill Rieflin mixes in his fills and such smoothly with the e-beats. But without vocals and only limited lead lines, the music struggles to find an identity for much of the 48 minutes. Two tracks in particular do work really nicely though. "Frolic" is tribal and 'ethnic-sounding' (great bass soloing here) and "Sauce" features a 'rosin-y' drone backing and great spacey effects (and more cool bass). The synth rhythms on this one I'd classify as tolerable - not the strongest point of the music here. Other tracks have a bit of 'cool jazz' flavor, elsewhere a bit of funkiness and a smidgeon of reggae. "Strife" was also quite good with lots of (seemingly) jungle sound effects. My biggest personal beef with 'Road Movies' is the frequent bits of trumpet, which I am hardly ever happy to hear.... but maybe that's just me. Overall, it's a decent enough album, but against the new improved Hana it seems a little secondary. I suppose I might make the suggestion that the two bands combine into one (given the two common members already), but I'm not sure that's really necessary since Hana (as it is now) is working so well. First World Music is at PO Box 30932, Seattle WA 98103 and on the web at http://www.firstworldmusic.com, where not surprisingly you can also find out about Greinke's other works and also Roderick's post-SCM project No Futuro (also including SCM guitarist Bill Bernhard).